Rock and roll isn’t just for the boys, and it isn’t just for big cities on the coast either. Witchsister, an all-female rock band by way of Fayetteville, Arkansas is here to prove they have what it takes to rock out and melt faces. Witchsister was conceived when Stephanie Petet was in search of a creatively stimulating environment where women could take the stage and shine. She proposed the idea of forming an all-female rock band to her sisters and cousin; her ultimate goal was to push the boundaries of rock ‘n’ roll. Being a family affair and sharing the same passion for music, Witchsister crafted their sound after rock ‘n’ roll staple bands like Iron Maiden and Black Sabbath while mixing in their influence from groups like Rage Against the Machine and Primus. Not only do they rock hard, they are a band with something to say. Their latest single “Cat Called” brings light to this situation and highlights the statement they are trying to make. The song brings attention to the badgering and ignorance that females in the music industry face, and they have had enough. Visually speaking, “Cat Called” encompasses the bands memorandum and their unique edgy lifestyle. Tastefully chaotic shots mixed with their wild child and rebellious nature are a nod to the lifestyle Witchsister rides by. The issues that “Cat Called” brings to fruition are rendered once our opening scene commences. Viewers find the ladies wandering Dickson Street, the main hub for weekend action in Fayetteville, and everything you would expect to happen on a weekend night in downtown, does. Bar crawlers getting in the way of shots, taking pictures with them, and dancing behind them accurately depicts that they are not taking what the band does seriously. Going against what everyone thinks is the driving force for Witchsister. Witchsister’s aggression and angst is not limited to their studio recordings or videos; their live show will leave you collecting your jaw off the floor and questioning everything you know about rock ‘n’ roll. On stage, the ladies showcase their remarkable musicianship and transform into possessed versions of themselves, letting their inner frustrations come to the forefront. Channeling that into their shows allows the audience to break free of everything that’s holding them back and let loose with the band. 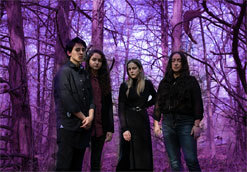 Here at HIP, it is an honor to be working with a band as raw and enthusiastic as Witchsister. With a strong message and a desire to rock, we’re certain that you and your viewers will embrace this video and message as wholeheartedly as we have. Rest assured we’ll have plenty of outstanding Witchsister merch to set up online/on-air contests and giveaways throughout the campaign so don’t be bashful about reaching out to get your hands on some. Please feel free to contact Andy Gesner and the HIP Video Promo team at (732)-613-1779 or email us at info@HIPVideoPromo.com. You can also visit www.Facebook.com/Witchsister for more information on Witchsister.